Our biomimicry challenge What Would You Ask Nature? drew dozens of real-world business problems submitted by companies from all over the world. We assigned three challenges to three firms and paired them each with a biologist. For the next three weeks, each team will be reporting their bio-inspired solutions. sustainable development company, has been helping neighborhoods create long-term plans so that they can receive funding under the City of Portland’s EcoDistricts Initiative, a new program that hopes to accelerate sustainable neighborhood development throughout the city. in the center of the neighborhood that featured green buildings. But Brightworks became interested in seeing how these practices, if implemented, could start to spread into the neighborhood around an ecodistrict. The challenge that Brightworks submitted to the What Would You Ask Nature? 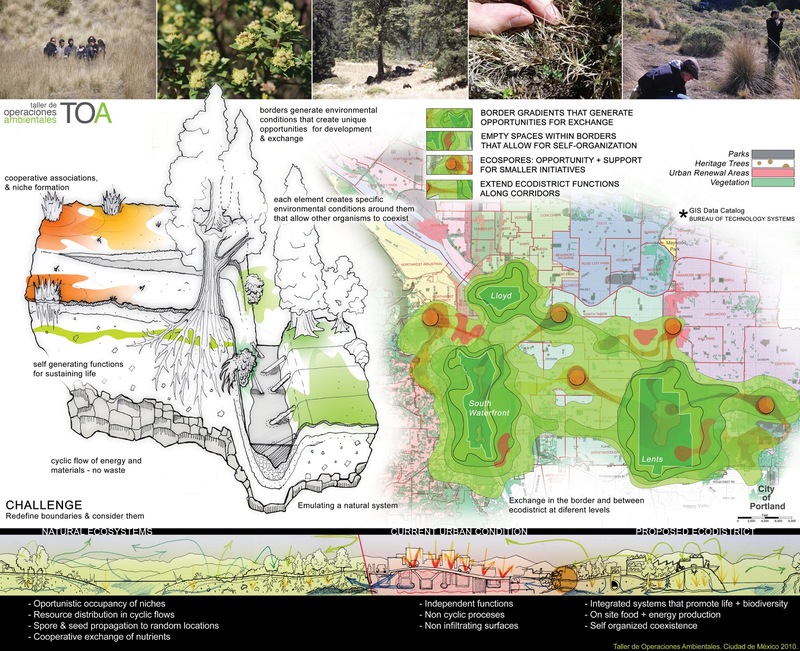 biomimicry challenge was to understand how these layered, systemic sustainability issues–clean water, efficient transit, green building–could be more effectively addressed throughout each district to encourage green, sustainable growth that spread beyond its borders. function in nature? How do independent beings come together to form a bigger entity? with their firm. 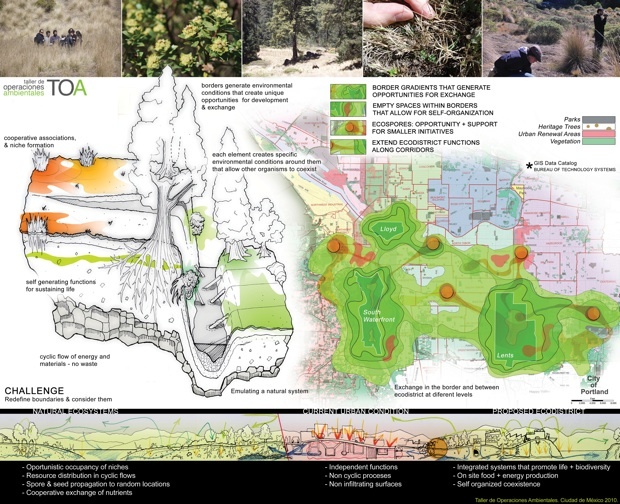 Under Rovalo’s guidance, the designers worked to distill the challenge, reframing the idea of ecodistricts within nature’s parameters. One early discussion proved critical to their solution: The team questioned the idea of funding for ecodistricts being allocated on a square-foot or per-foot denomination–that’s not how nature works. Removing this constraint from the process allowed them to come up with more innovative ways for expending energy and denoting funding. intimate symbiotic relations with all of them–just like the interconnected systems of water, transit, energy, food that crisscross a neighborhood. what is needed and fill it in. “Nature allows for empty spaces,” says Rodríguez. “These are empty spaces that don’t necessarily have a function, but they are left there for someone else to take over.” Empty spaces occur in obvious places like trees, of course, but Rovalo told a very interesting story about saguaro cactuses in the Sonoran Desert. Woodpeckers create holes in the giant cacti to make a home, but then will abandon it after three years. At that time, however, owls will move in, which rearranges the ecosystem because mice and other smaller animals will have to adjust to the new predator. This seemingly random occupation of empty spaces actually regulates and balances the flow of nutrients and energy throughout the desert. The team was extremely inspired by this idea, denoting 20% of resources to such spaces, which again goes completely counterintuitively to methods of city planners, who often believe that empty space creates the illusion of economic distress. But this way, Rodríguez says, the plan would include a very social component as residents would have more of a say about building their own communities. “People could appropriate it themselves, and discuss what groups are appropriating it and why, and for how long, sparking discussion,” says Rodríguez. Finally, the designers recommended another element: Satellite nodes of sustainable development that occur outside the ecodistrict. This idea was culled from the way mushrooms and fungi launch spores far outside of their own community to start new communities. 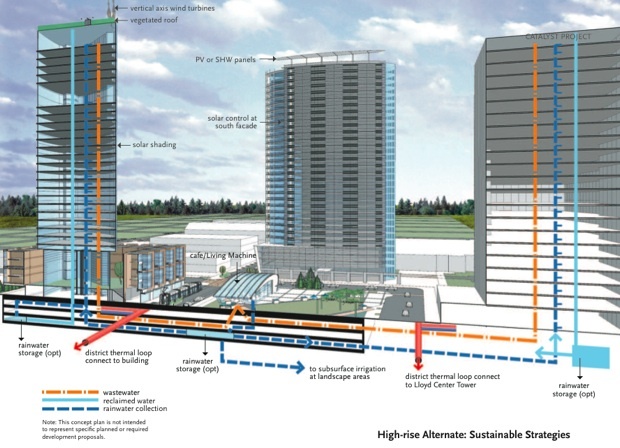 This would mean sustainable actions could occur outside the ecodistrict, as small group initiatives, which would also allow groups to self-organize and participate in the same way as inside the district. These nodes, like seeds, would spur new development that would eventually spread to the areas in between. TOA proposed that 10% of funding be allocated to these projects. smaller communities to sprout up outside the established group. 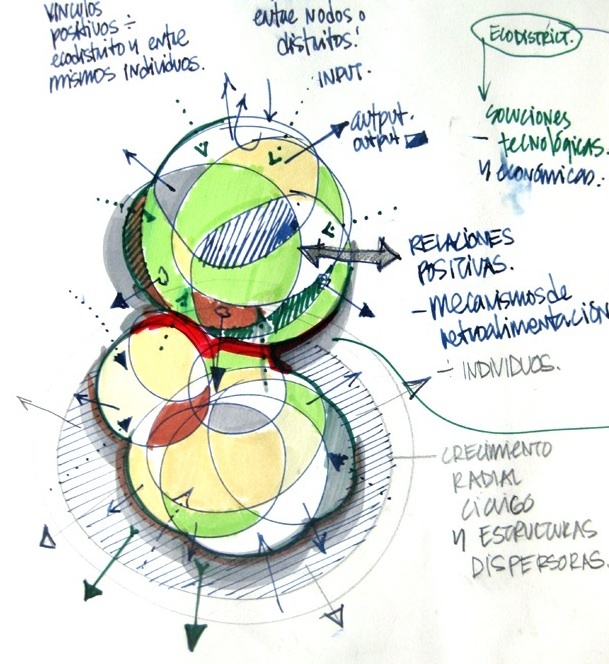 In this illustration, you can see how these ideas could be implemented in a real-world scenario. Building sustainable neighborhoods using TOA’s methodology would give communities new tools with which to green their environment. More flexible systems around resources, like food, water and energy production, could be clustered around the border to encourage adoption outside the ecodistrict. The colonization of empty spaces would give residents a sense of self-organization and autonomy to regulate the needs of their neighborhood. And the nodes of activity outside the ecodistrict would help launch visible, sustainable development out into the community. These ideas, if implemented, would radically transform the traditional way that developers and designers look at cities. Special thanks to the Biomimicry Institute and the Biomimicry Guild for partnering with the Designers Accord on this challenge. If you have a design and sustainability story to share, let us know about it! Check out the brand new Designers Accord Web site. And follow us on Twitter @designersaccord to hear what the Designers Accord community is thinking about.